by Mitchell, Williams, Selig, Gates & Woodyard, P.L.L.C. The Court of Appeal of Louisiana (“Appellate Court”) addressed in a March 20th opinion causation issues associated with a bodily injury claim allegedly associated with mold exposure. See Yaukey v. Ballard, 2019 WL 1275175. The question involved whether there was a sufficient causative link between some individuals’ alleged health problems and a certain mold found in a residence. A lawsuit was filed by Laurie Yaukey, individually, and Peter Yaukey, on behalf of their children, (collectively “Plaintiffs”) seeking damages from lessor/Defendant Marian Ballard (“Defendant”) alleging mold exposure at the leased property. Plaintiffs alleged that mold resulting from water leaking inside the leased property over a period of time generated certain medical conditions because of the mold exposure. Whether mold constitutes a threat to structure occupants can involve difficult questions of causation. This is not a problem limited to mold. Determining what concentrations of a particular environmental contaminant poses a threat to human health can be a complex exercise. Establishment of acceptable mold concentrations or exposure limits is challenging for two reasons. First, there are thousands of different species of mold. Second, each individual’s sensitivity to exposure to mold will vary. Mold growth occurs through multi-cellular structures known as colony-forming units. The organisms reproduce and spread by airborne dispersal of lightweight spores. Spores will germinate if they have access to a food source. The spores are generally responsible for the health effects associated with mold. Tens of thousands of species of mold are found throughout our environment. However, there are certain species that receive a substantial amount of attention in the indoor context. These species may be deemed more problematic because of concern that their presence poses a threat to health or as an indication that conditions are facilitating non-routine mold growth. Species that tend to attract attention in the indoor air context include Stachybotrys chartarum, Penicillium, and Aspergillus. Defendants filed a Motion for Summary Judgment arguing that the Plaintiffs could not prove that mold exposure was of a dose sufficient to cause health effects (described by the lower court has “general causation”). As a result, they contended there was not a sufficient causative link between the Plaintiffs’ alleged health problems and the specific type of mold found in the property (described by the lower court as “specific causation”). In addition, the Plaintiffs were deemed by the to not have the required medical expert testimony to establish both general and specific causation. The Defendants attached, in support of the Motion for Summary Judgment, exhibits such as the depositions of the individuals, various treating physicians, medical records, and an affidavit of their expert environmental scientist/microbiologist along with his report. The Appellate Court states that the exhibits demonstrated that Ms. Yaukey had complained of mold exposure since Hurricane Katrina in three properties (including the property involved in the current litigation). Also referenced was what is described as Ms. Yaukey’s “extensive medical history” predating the current alleged mold exposure with a variety of ailments.
. . . conducted a moisture inspection and found no active moisture concerns. He found that the indoor airborne fungal ecology within the living areas sample was within normal parameters. The Plaintiffs responded with an affidavit of their expert who included what is described as a “Microbial Assessment Report” and medical records of an Atlanta doctor. His inspection is stated to have revealed elevated levels of certain molds through a tape-lift sample taken from the interior air conditioner. An air sample analysis from the master bedroom was stated to have been within normal mold ecology levels as compared to the outdoor air sample. Further, lower airborne levels were found in the children’s bedroom. a sufficient causative link between the alleged health problem and the specific type of mold found (specific causation). The Appellate Court concludes that the Defendants had adequately shown there is an absence of factual support for both general causation and specific causation. It further determined that Plaintiffs failed to produce any evidence to establish they would be able to satisfy their burden of proving general and specific causation at trial. There was an acknowledgment that Plaintiffs had noted exposure to mold (the two referenced types). However, it concluded there was no evidence to show they were exposed to a dose sufficient to cause health effects or that their health problems were linked to this mold. As a result, Defendant was granted Summary Judgment. 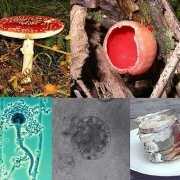 Wikipedia.com	Are Fungi and Molds Plants?